Dance in the Moomba Parade 2018 - Register now! Let's show Melbourne how great this sport is! We are excited to announce that in March 2018 we will be promoting DanceSport to the crowds at Moomba! We are looking for up to 60 volunteers to demonstrate how great our sport is. An opportunity to perform in front of a huge audience! Get in quickly - first in, best dressed. Once the team has been chosen, we will email you confirmation along with details of training. DanceSport Victoria (DSV) are providing a grant to fund the coaching, event marketing and fees with Moomba. 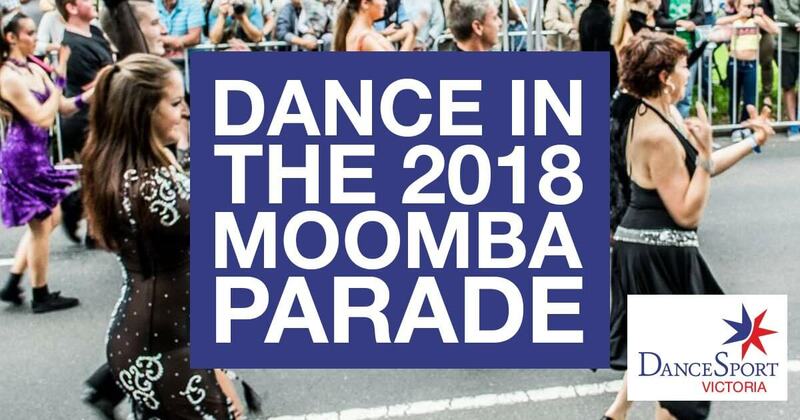 The DanceSport Victoria marketing team will work with Moomba to register the team and provide marketing via Facebook, as well as advertising material for our member studios, i.e. RTFs.